While I’m busy wrapping up some portions of my book project I have another beautiful guest post to share. 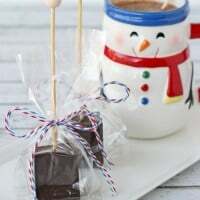 Today, she’s sharing this beautiful recipe for quick and easy White Chocolate Pretzel Candy Bark. Hi, I’m Julie! And I’m so happy to be guest posting for Glory today! Huge congrats to her and her book deal…I cannot wait to see it. I was so honored when she asked me to guest post. I LOVVVEEE her blog! I met Glory on my first blogging/brand trip to Wilton a couple of years ago and last year when I was visiting San Francisco for the day, she offered to drive close to three hours to hang out with me and show me around…because she is such a genuinely sweet person. I had a blast! We ate and shopped and ate. It was so fun! I can’t wait to go back one day and hopefully she would drive down again. Today, I wanted to show you how to make a super sweet and super simple bark candy. But first off, the idea for these came from…wanting to do something with sprinkles. I have an obsession with sprinkles and honestly I don’t bake with them enough…I have made these brown butter funfetti sugar cookies so many times. Raise your hand if you like sprinkles! I know, I know it’s not the holidays and why am I making bark in the spring? Because I want to. Just kidding. I think it’s perfect for Mother’s Day because my mom LOVES white chocolate. And with the pretzels, there’s a nice balance of salty and sweetness. It’s perfect for baby showers – as a favor or just a nice treat…or as a thank you. 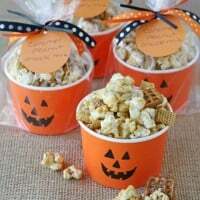 Just exactly what I’m using these special treats for. It’s kind of hard to see but I used two pieces of parchment paper put down into the square pan in different directions to create a sling. I also used a round cake pan so I could vary the layer colors. If you’re using a round pan, spray the inside sides of the pan so it doesn’t stick and then lay down a piece of round parchment paper. After pouring the first layer of chocolate into the pan, add the pretzels and be sure to press them down. After adding the second layer of chocolate, I added confetti and regular sprinkles. These treats are going to the vet office tomorrow, I have to take Charley, my dog, for two different appointments and I thought I would bring these as a way to show how much I appreciate them. They always appreciate a sweet treat as a thank you from us. I took regular treat boxes and added washi tap to trim them and to make them look a little different. And that’s it! So simple. Sweet and salty…a great combo, right? 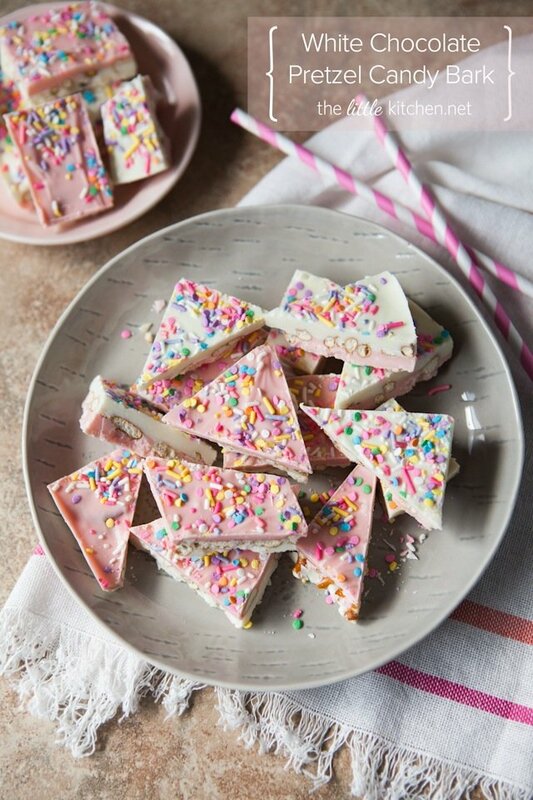 Sweet and salty, cute and easy, this White Chocolate Bark is the perfect snack or gift. For a square pan: create a sling by tearing two sheets of parchment or wax paper and lay them in the pan perpendicular to each other. For a round pan: spray the insides of the sides of pan with baking spray. Wipe the bottom of the pan if necessary. Cut out a piece of parchment paper or wax paper the same size of the pan (lay the pan on top of the paper and mark with a pen then cut out). In one microwave safe glass bowl, microwave the white chocolate chips on 50% power in 30 second increments until melted. Mix with a spoon after each microwaving increment. Pour first layer into pan and using a spoon or butter knife, spread evenly. Add pretzels and press down. Refrigerate for 5 to 10 minutes. Melt second layer of white chocolate & candy melts in the same way as the first layer of chocolate. 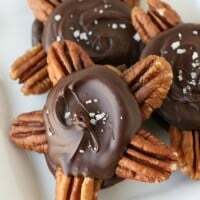 Remove pan from refrigerator and pour melted chocolate/candy on top of the pretzels. Using a spoon or butter knife, spread the chocolate evenly. Add sprinkles, cookie crumbs or whatever you'd like to on top. Refrigerate for at least 1 hour before cutting with a sharp knife. Use whatever colors or candy melts you want for each layer, the sky's the limit depending on what event you're making these for. Don't let your glass bowls set, soak them in hot water and soap immediately to make your clean-up a lot easier. Thank you Julie for sharing these gorgeous treats with us! Find Julie at The Little Kitchen.net, on Facebook, Twitter and Pinterest. that looks so crazy good. i love sprinkles. i’m almost 40 and i love sprinkles. i don’t care who knows it! 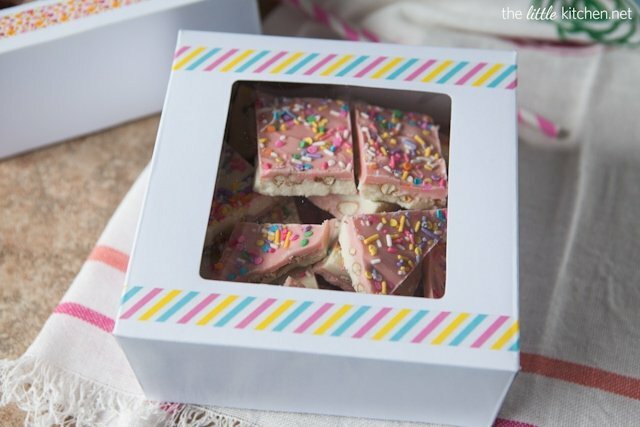 We love white chocolate, and these are so pretty with the pink and sprinkles! Yummy! Thanks! As I said on Julie’s site, this is adorable, beautiful, and PERFECT! 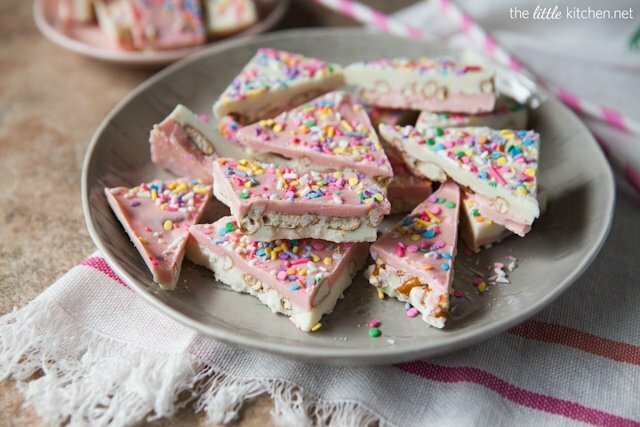 No-bake, white choc, with sprinkles, pink, salty and sweet. You covered it ALL! Pinned! These are sooooo pretty! Love them. And love that you’re taking them to the vet. That is so sweet of you. Adorable! I love white chocolate and pretzels together. And the sprinkles make this just so happy! Loving the pink too. Beautiful! And I don’t see any reason why bark has to be saved for winter! Especially when you can make it look so light and spring-y! 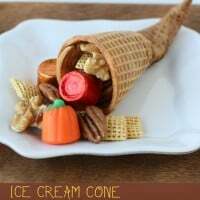 Loving this recipe… simple yet delicious! I think I could stare at these beauties all day:) YUM! 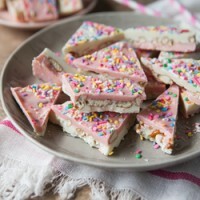 The white chocolate and the sprinkles makes this the prettiest candy bark I have ever seen! The perfect candy bark for those who like salty with sweet. I am sure your vets office will love your “appreciation in a box”. Pingback: Lattemamma » Hauskaa Vappua! MMM made this for a backyard potluck, it was sooo good! Wasn’t able to find pink candy melts so I substituted Smarties instead, which didn’t melt of course, but were still colourful and yummy. Looks beautiful, please let me know where these gift boxes are from, I’m looking for something very similar. TIA! The post is from a couple years back, but I believe those boxes are Wilton brand (available at Michael’s and Joanne’s) and are designed for cupcakes. I also buy boxes for my treats from BRP Box Shop ( brpboxshop(dot)com ) and they have a ton of different sizes and looks.